I would like to know how to set the user account picture in Windows 7 in HP desktop. How to set this up? 1. Open the Start menu, and click on your user picture. 2-Select a picture from the default Windows 7 pictures, or click on the Browse for more pictures link and navigate to a image of your own to use instead. Click on the Change Picture button. 2. Open the Control Panel , and click on the User Accounts icon.Click on the Change your picture link. 3. Select a picture from the default Windows 7 pictures, or click on the Browse for more pictures link and navigate to a image of your own to use instead. Click on the Change Picture button. 1.Click the Windows logo in the lower left corner of your desktop.Type "User Accounts" in the instant search field. "User Accounts" appears in the list for you to select.Alternatively,click "Start","Control Panel","User Accounts & Family Safety",then "Add or Remove User Accounts". 2.Select "Change Your Picture".A list of default photos appears. 3.Choose "Browse for more pictures",then navigate to the folder in which you have stored the photos you wish to use. 4.Select a picture and choose "Open".The new picture is applied to the user account.Repeat this process for additional user accounts by choosing "Manage Another User Account". 2. Open the Control Panel (All Items view), and click on the User Accounts icon. 3. If this is your current account you want to change picture of then click Change your Picture & then browse the picture > Click Ok.
4. If you want to change another account picture then click Manage Another Account > Select the account > Click Change picture & then browse the picture > Click Ok.
Congratulations ! You've successfully changed your desired user account picture. where we have saved uor picture. 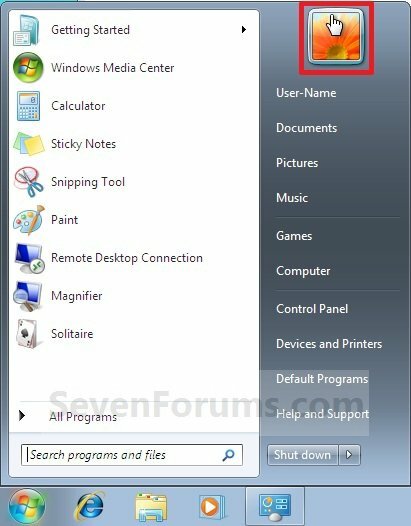 Here you have step by step procedure to set user account picture in Windows 7. Open start and hit on computer. Now go to this path : C:\ProgramData\Microsoft\User Account Pictures\Default Pictures.. Select the image that you want. The image that you gonna create must be saved as .bmp file and the size should be 128x128 pixel. ->firstof all go to "control panel" option. ->And there you can able to seen the "user accounts and family safety" option. ->Click on it and go to "user accont" option. ->So there you will find direct options changing user name,picture...! ->So you proceed by by click on the "change account picture" option. Go to the control panel from the task bar. Open the user account settings. On the left side you will see various options such as change the user account icon, change password etc. Now the select the one which says change the account image icon. Select that option and than in a new screen there will be a list of icons from which you can choose your new account icon. Once done click on apply and than save . STEP 1: Open Start Menu > Click on "User Picture". STEP 2: Select the Picture which you are interested in or Browse for more Pictures. 4. Click on the change the User Account Picture. User account is the picture that appears when your computer starts or you log in to it after it has went to sleep. It appears just above the box where you enter the password for your account. Windows 7 gives you the option to set the picture that you like most to use as your accounts picture. 1.Click on the windows icon and in the window that pops up click on your user picture. 2.Now a control panel window will appear.Now click on change your picture. 3.You will be presented with the list of the pictures of your computer.If you want to add some other picture click on browse for more pictures. 4.Choose the picture that you like and then click on change picture. 5.And you are done ,you have set your account picture according to your wish. My friend it is very easy to change profile pictures. Start button on the down left corner . 3.click Change your Picture & then browse the picture from where your picture is currently located. If have any problem you can go to help of windows 7. <> IF YOU WANT TO SET THE PICTURES THEN FOLLOW THESE STEPS. First of all switch on your computer and laptop. Go to the window logo. ^ Window logo situated in the left bottom of your computer. ^ You can type the User Account. ^ OR There is another option to go through the control panel. ^ You can chose a right path according to your choice. ^ Click on the control panel. ^ Go to the USER ACCOUNTS & FAMILY SAFETY. ^ GO to ADD or REMOVE USER ACCOUNTS. ^ Click on Change your picture. ^ After click a list of the default photo appear. ^ Click on BROWSE FOR MORE PHOTO. ^ Select a Picture and open. ^ The new picture is applied to user account. ^ If you change the picture then Reply this step. start and type user accounts,it will show many results click on user accounts. A window will appear with list of existing users on the computer. select the user of whom you want to change the picture. or browse through the drive for any other image which you like. Browse For more Picture Options. First click on "Start button"
Now select "Add or remove user account"
Now select the account witch u want to change the pic. Now select change the picture. After that u can find many default picture.u can choose one of then or u can browse other picture from ur hard disk. After that click change picture button. you can do this just follow my instructions. 2.in start menu click on control panel. 4.in that click on the your user picture below user account. 5.then a window will appears with the title "choose a new picture for your account".then select the picture you want to put as your account picture. 6.thats it you are done.you have changed your account picture. 7.you can browse the pictures from the browse option. --Then select Change Your Picture-->>Plenty of pics will appears. --choose a picture if you want to else choose Browse for more pictures, then choose the picture from the folder you want. It is very simple process you can set the picture your user account you have to following these steps. 3.now open the user accounts . 4.here you can change the password and set the picture in your windows system. 5.double click on the user accounts it will show the options . It is too easy to change the Picture of User Accounts. 1. Click the Start button then, Select the control panel. 3.Click Change your Picture & then browse the picture from where your picture is loaded. If you want to setting the user account picture in windows 7 ..
4.Here your can also do all the setting which you have want..
Click on the START tab. Now select the control panel. Now you need to click on the user account. Select the option Change your picture. Now you need to browse to the place where the image of your choice is placed, just select it. At last select on apply and then Ok. And you will find the changes made successfully. Friend, setting user account picture in windows 7 is a much simple step. What you need to do is just open your CONTROL PANEL. Now click on "Add or remove useraccounts". Click on the ccounnt you want to change picture. Now click on "change the picture". Either you can select from the list of pictures available or you can even browse your harddisk for some other picture. Click on "change picture" and youare done. Click on "Change your Picture"
Today i am gonna help you to solve your problem k, You pls don't worry k and just follow my steps k.
1.Go to start menu k.
2.Now click on the picture available on the to of the start menu k.
3.Now you can see an option with several pictures k.
4.Now select any one picture available over there or else click on the link and download latest pics of your need k.
5.If this process doesn't work then click on start menu and select the control panel k.
6.Now click on the user account option and do the same process which is narrated above k.
1.Go to control panel which is present in start. 2. In that go to User accounts and family safety tab which is shown below. 3. Click the change your picture option. 4. Select your desired picture and click ok. 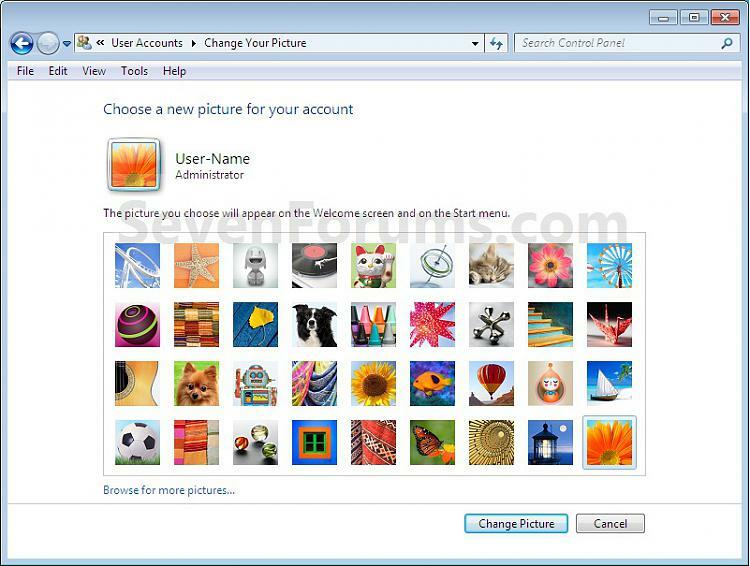 Setting User Account Picture in Windows 7 is very easy. 1. Click on Windows button. 2. Then, type "User Accounts" in the Search Bar. 3. Open it, then click on Change your Picture. 4. Select the pictures here, or click on Browse for more pictures to locate picture from your Stored data in Hard Disk. 5. After choosing picture, click on Change Picture. 6. Now, your picture will be set according to your choice. 2.Then "User Accounts and Family Safety"
3.Then go to "User Accounts"
4.Click on the "Change Your Picture"
5.Click "Browse for more pictures"
2.Then go to "User Accounts and Family Safety"-->"User Accounts"
3.Then click "Change your picture"
That's it your user account picture will be changed accordingly! 2.Later you go to the 'Control Panel'. 3.Then you go to the 'User Account'. 4.There you make a click on your 'User Account'. 5.There you click on the option 'Change My Picture'. 6.There you select the picture which you like. 7.At last click on the option 'Change Picture'. >>Click on "User Account and family safety"
>>Click on "Change your picture"
8-Browse For more Picture Options. >firstof all go to "control panel" option. >Click on it and go to "user accont" option. >you will find direct options changing user name,picture.! >click on the "change account picture" option. How can I restore guest account picture in windows XP professional?